CoilBuilder_99 is a powdered iron inductor winding application. Enter desired inductance, select core size and mix and press the Calculate button to determine the correct number of windings for your inductor. Data is also given showing, core color, permeability, frequency range, AL value and maximum number of turns versus wire guage for the chosen core size. Encompasses 12 different core sizes and 8 different mixes of powdered iron. Calculated results can be stored on a disk file or printed out. Inductance range 0.5 – 125 microhenries. Entry limited to 5 characters which must only be numbers or a decimal point. The output editor can be used for adding notes etc. Please note that it will only hold a maximum of 10000 bytes worth of data. After 10000 bytes it will not accept anymore calculated data and there will be no error message. Save data in files that are less than the 10000 byte maximum. The Wire Data button dumps the maximum wire guage versus core size data into the main output display. The Clear File button can be used to close the currently opened file if the user wishes to do so. but folks come to other conclusions when looking at traditional solenoid coils with fractional N ability. Toroids only have whole number of turns. Highest Q comes with largest wire, but only if you can get the wire on the core. Air gaps degrade Q and stability. 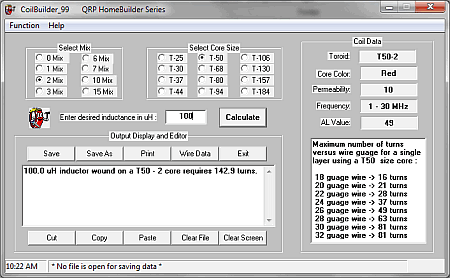 If the program tells you you need 10.8 turns, use 10 and a wire size that will allow some compression. You can then compress turns to hit the L right on.